Hello friends. I crocheted this baby vest and hat set, made for a girl or boy, and I wanted to share it with you. I made this baby set, and I will donate it to be sold at our holiday crochet sale that we have each year at our church. 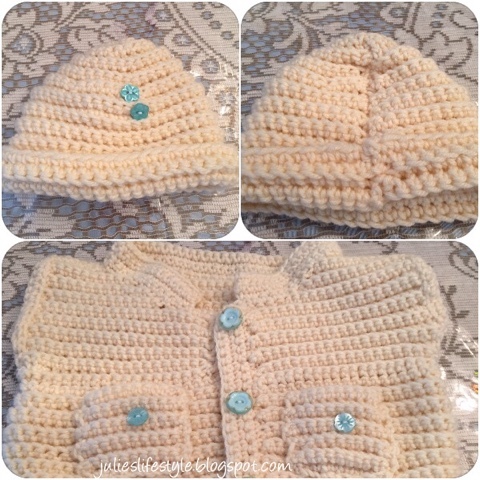 I added small light blue buttons to the hat and vest so that a baby girl or boy can wear it. The hat was easy for me to crochet and I think it came out cute. The baby hat is made into a rectangle shape and then sewn together in the back. I made it so that it can be folded up at the bottom of the hat. The pattern for the hat was made by one of the ladies that used to be in our crochet group. Sorry I do not have that pattern to share with you. I have a similar hat pattern that can be found HERE. 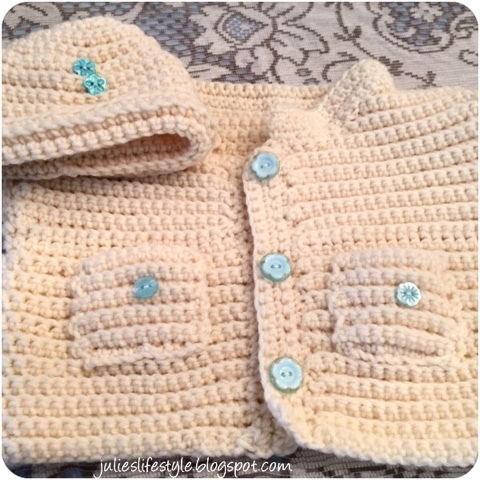 I found the pattern to make this crocheted baby jacket from favecrafts. To make your own crochet baby/tweed baby jacket or (vest as I made it), you can find the pattern HERE. ** NOTE - I did not use the yarn that they called for in the pattern for the jacket. The yarn I used is Caron Wintuck in the color FISHERMAN 3062. The sweater pattern had red buttons, but I made mine with light blue buttons. This is my second baby outfit I've made, and I was so inspired to try and make this one. If you would like to see my first baby sweater you can read that post HERE. I will have to say that this was difficult for me to crochet and I had trouble with it. I wanted to make this into a baby sweater, but I made it into a vest instead, because the sleeves were not coming out correctly. I had to rip it out too many times! I think it still looks cute as a vest, and I enjoyed crocheting the hat. I am so glad that I pushed myself to be challenged to make this baby vest. Have you ever challenged yourself with any crochet or knit projects? To see more of my crochet projects you can click HERE. Thanks for stopping by and I hope you all have a nice end of the week and weekend! Despite the unraveling you had to do, strenuous job I know, I've been there :), it turned out great and some lucky baby is going to wear it! It is beautiful and will be so nice and warm. I probably give up too quickly on some of my projects! You are so smart! Hugs! Well isn't that the sweetest!! Very sweet! I know the work that goes into that and I also know about ripping out a lot!! Awww the little set turned out so cute, Julie! How sweet of you to donate it. So sweet. You are so kind to make these beautiful pieces for your church sales. Great job Julie. Oh Julie...this is adorable. You did a fantastic job! It is just too sweet. Have a lovely week!